Look at this slab of juicy steak. Just imagine its texture, flavor, and the satisfaction of dabbing the corners of your mouth after demolishing all four corners of this fortress. This is an epic moment that requires concentration and perhaps just a bit of self-restraint. But not just any steak is worthy of such a description. 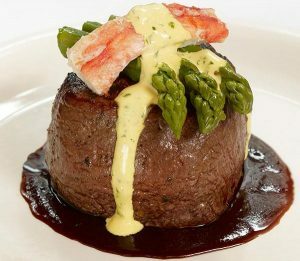 Sure, there are plenty of fancy places where a man can drive to eat steak, especially in Las Vegas and New York – but there are only a handful of steakhouses where a steak can literally drive a man to near ecstasy. 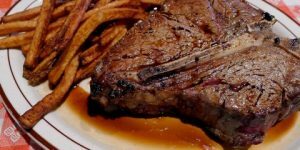 We’ve had many steaks over our lifetime, and not all of them were great, but we’re prepared to share with you the ones that made it into our little black books with an exclamation point. What Makes a Great Steak, So Great? 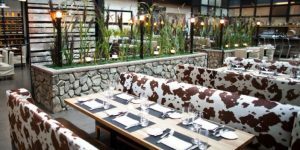 Allow us to pause from our list for a brief moment to explain what makes a steakhouse standout from all the rest. Number one would have to be a perfectly calibrated thermometer. There is no such thing as “pink” or “bloody” to an expert steak chef, as everything is rated by the temperature of the meat. And to help reach these numbers, a steakhouse should have a broiler capable of reaching temps of 1,000 degrees or higher. And using an infrared broiler is key to this, and that’s because they can heat more evenly than the typical “grill”. Next up, a great steak is only as good as the meat it begins with. That is why you will never see a steakhouse on this list that does not use “USDA Prime” as a bare minimum. We have also come to understand that wine ages to perfection, and so can a good steak. It is called “wet aging,” and this is when a good cut of steak is allowed to sit in its own juices in a vacuum-sealed bag for a couple days or weeks. This can actually make a steak more tender and flavorful than a “fresh” cut. And then there is “dry aging” which describes the process of allowing a steak to age in a humidity controlled room until it grows a little mold (don’t worry, it gets cut off) and a stronger flavor to boot. 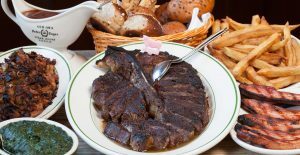 And finally, the best steakhouses often use a lot of butter. That fatty yellow stuff makes everything taste better from a roll to a dollop of potatoes, and you can bet your best cut of steak, that butter will make it taste better too. And while our love affair with a superb slab of steak may always end bitter-sweet, we can tell you that it usually begins medium-rare.